The Ravenna Army Ammunition Plant (RVAAP) in Ravenna, Ohio, formerly produced ammunition for U.S. military during World War II, the Korean War, and the Vietnam conflict. About 93% of the property that had been part of the RVAAP now has been transferred to the stewardship of the Ohio National Guard. This transfer created the Ravenna Training and Logistics Site (RTLS). The RTLS serves as a training ground for the Ohio Army National Guard. 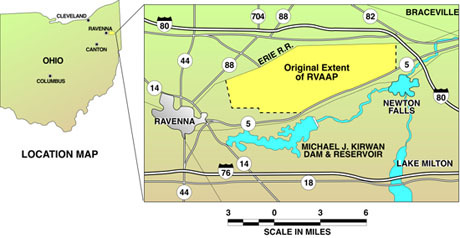 The remaining RVAAP property is being studied and cleaned up as needed to make its grounds environmentally safe for eventual transfer to the Ohio National Guard. The links in the left margin of each page of this web site may be used to navigate from page to page. When you click on links to other web sites or PDF files, use the ‘Back’ browser button to return to the RVAAP Access web site.